You see names like Augie Grill, Matt Hawkins and Ted Musgrave Jr. and you know that those guys are quality racecar drivers, especially in the Super Late Model world. But you then see names like Jason Hogan, Charlie Bradberry and Ken McFarland in the same field and you know those other drivers are going to have to have near perfect nights to compete. Well, on Saturday night, at Montgomery Motor Speedway, they had near perfect nights. who have served and who are currently serving in the United States Armed Forces, fans were treated a race that was decided on the very last lap. 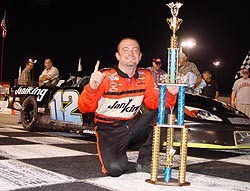 Grill passed Hawkins coming to the white flag to win Saturday night’s 125-lap Super Late Model feature at Montgomery and the impressive $5,000 first-place prize that went with it. Over the last 20 laps of the race, Grill and Hawkins put on a spirited battle, swapping the lead several times while literally racing side-by-side for five laps before Hawkins regained control of the top spot coming to the white flag. However, coming off of turns three and four, Grill snuck a nose under Hawkins and the two drag raced into turn one. Respectfully, like a racer well beyond his age, Hawkins gave Grill the room he needed to make the pass, and he motored away from his competitor down the backstretch and to the checked flag. Grill, along with fellow front runners McFarland and Hogan, pitted after a lap 86 caution for debris, which handed the lead over to Hawkins, who had already made his pit stop. Grill, McFarland and Hogan then rocketed up through the field, putting everyone else in their rearview mirrors and closing in on Hawkins. As Hogan began to fade from winning contention with an ill-handling racecar, the race became the battle of three cars for the top spot. However, Grill and McFarland bumped on lap 104, sending McFarland spinning and to the back of the pack, leaving Hawkins and Grill to battle it out for the top spot. Grill got by Matt Hawkins with just one lap to go to win $5,000 on Saturday night. McFarland wasn’t happy about the bump, but didn’t do anything on the track to show his disgust with Grill’s maneuver (except for a friendly little bump during the cool down lap after the race). 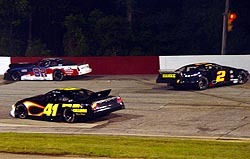 After the contact, the race came down to a shootout between Hawkins and Grill. “In the race, my throttle cable was hanging up. I was going into the corners wide open. I was having to stomp on the brakes to get the car to stop. It was doing it the whole race. “We got out to the lead and I was just trying to hold on. I just got real loose in the center of the corner late. He got into me and there was nothing I could do. I couldn’t keep the car on the bottom. With three laps to go, I thought I had him, but I got in a little deep one time and it got loose. It wasn’t loose the whole race until right there at the end. 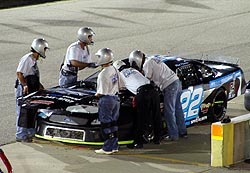 Hawkins team spent much of the day and night working on the #22 and it paid off. Musgrave Jr., son of NASCAR Craftsman Truck Series star Ted Musgrave, finished third for the second-straight race after making it by Hogan and Josh Hamner late in the race. Hamner finished fourth with Hogan coming home fifth. The start of the Super Late Model race was marred by a huge crash which took out several cars, including local favorite DuWayne Middlebrooks. The accident started when Johnny Brazier’s car spun the tires and failed to come up to speed as fast as the rest of the field as the green came out. The resulting stack up of cars involved 10 cars. Four of those drivers were able to return to the race later. Speed51.com will have much more from the race later this week in Leftovers. With Hogan running in the lower half of the top-five, McFarland mid-pack and Bradberry out of the race, the night belonged to Grill, Hawkins and Musgrave. And by no means were any of the top-three finishers slouchers on Saturday night. Grill started third. Hawkins started fifth. Musgrave started sixth. In a field of 21 Super Late Models, that was impressive enough. Even more impressive was the fact that they three out-raced, out-smarted and out-did the rest of the field, including Hogan, Bradberry and McFarland. 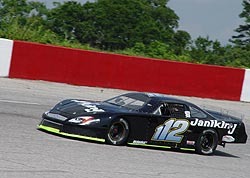 Hawkins held on to second, which was a feat considering the #22 team suffered through a variety of problems during the afternoon’s practice sessions and even early after the start of the race. The team’s engine sounded horrible during the day’s practice and they got minimal track time while trying to diagnose the problem all afternoon long. Come race time, the team had to make an additional early stop to fix another problem. “The fuel pump was turned upside down,” said Hawkins of his afternoon problems. “We’ve had it that way for a while. I guess that is what happened to me at the end of Lakeland when I thought the car wouldn’t run. An early wreck took its toll on 10 cars.